DHV supports images of almost anything you would want to configure. Usual configurations cover facades, kitchens, bathrooms and sometimes living areas and hallways. These images are taken of existing builds, display homes, elevations. Using a custom, proprietary method, we compensate for 3 dimensions and stencil the image ready for product application; this process enables us to have perfect scale for textures, and realistic flooring, roofing and render. Our week-long image process makes for images which are photorealistic, blemish free and stunningly real. DHV can support custom product libraries from any manufacturer on the planet, or draw from an in-house library of generics. For custom products, we use complex scanning and replication methods to ensure the photographic duplication of any paint or texture required by the client. Each product is entered at scale; combined with our stencilling process, the two combine for a visualisation experience that is photorealistic. Tiles apply and intersect where they would in real life, wood floorboards appear completely authentic. To complement visualisation, each home lists discoverability information below its image. 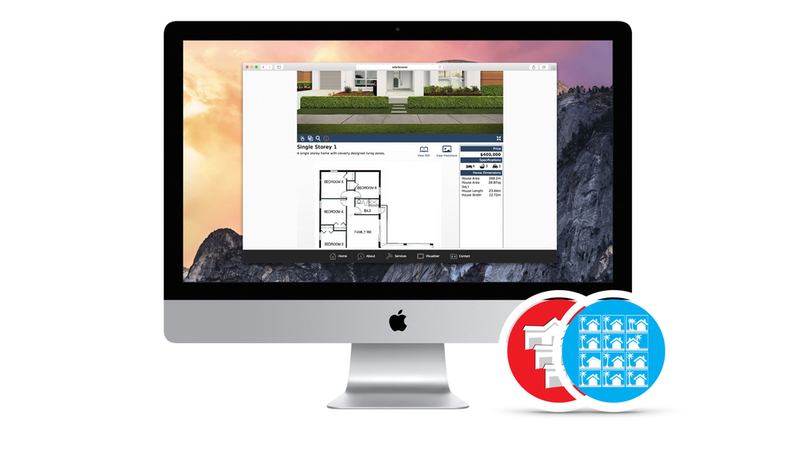 This provides your customer with pricing and inclusion information, house plans and descriptions that help the customer understand the product. Once the customer has put together a vision of their design, the application empowers them to share their design choices. These blueprints can be printed and taken into a display centre to select the final build specification, or handed directly to the builder to guide and enable construction. No Visualiser is an Island. Built-in sharing options are available to engage with consumer social networks, allowing your customers to share their ideas and creations with friends & family. This further helps to galvanise the decision making process, and speed up preparation time. This provides time-poor customers a more engaged home-building design and selection experience. Dream Home Visualiser can be configured to offer powerful insights into the usage habits of your customers. The feature enables you to see valuable demographic information about the people using the application, including the duration of use, how often they shared their ideas, what times they visited and the number of times clients were shown supplierâ€™s branding. DHV enables you to see which products and brands are most popular for an individual surface, and what products are saved into the most configurations. Using these powerful analytics you can ensure only the most popular products are displayed, saving money and streamlining the decision making. The Power to Take Control. An option is available to have full control over the product library, letting you add and remove products as they move in and out of production and fashion. Additionally, we can deliver software and train staff in our proprietary image insertion process, which reduces cost in the long term and gives the organisation complete in-house power to maintain image currency. This delivers the most cutting edge & vogue library of products for your customers to select, helping them stay on the cutting edge of fashion and design trends thus helping bring their design closer to a reality. Autech developed Dream Home Visualiser to be multi-lingual. As of the 2011 census, almost 20% of people spoke languages other than English at home; by enabling the app to display in a multitude of languages more of your customers can now easily and comfortably design their dream. With a growing percentage of new home buyers speaking languages other than english, the ability to deliver a home portfolio in any number of languages makes your product offering more accessable. This is Dream Home Visualiser: the World's most powerful selection tool | By Autech Software. The World's best Visualisation developers.